While there are no surviving images of the First House, this is the floor plan. This day we are removed into our own house. Though in an unfinished state, it is more comfortable than the habitations of many. The Fishers’ new home was quite small, being only one-and-a-half stories tall, with two rooms on the ground floor and a small sleeping space under the roof. But for a newly-wed couple on the Maine frontier it was perfectly comfortable. 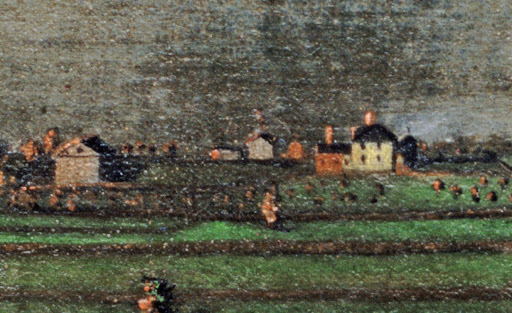 A detailed crop of the Fisher Farm from A Morning View Of Blue Hill. The Fishers’ first child was born only a few months after they established themselves in their new home, and seven more children had followed by 1810. It was very soon apparent that the original three–room house was too small for the family and the parson began to plan a substantial addition. In 1811, perhaps in anticipation of this activity, Fisher constructed a wood-house in his yard, in which he installed the first wind-powered saw in Blue Hill. A day of care & business—Mr. Holt, Steven & Mr. Smith worked A. M. on frame. Worked myself stripping old house & drawing nails. About 100 hand collected & assisted me in raising my house, with plank sides, which went up well, & no person was materially hurt. After raising partook of a bountiful supper & after supper had pleasant singing. Blessed be God for the variety & abundance of his mercies. It took several years for Jonathan Fisher to complete his house. His journal shows that the parson was working to finish the building well into 1818, the year when he finally painted the exterior. A photo ca. 1888 of the New House with outbuildings visible to the right. The Fisher homestead, house and outbuildings, remained in its original condition for a number of decades, even after the parson passed away in 1847. At the end of the nineteenth century, however, Jonathan Fisher’s grandchildren decided to renovate the house. In 1896 they tore down the original house of 1796 and replaced it with a two-story addition to their grandfather’s 1814-18 house, which they left untouched. In the following decades the homestead’s outbuildings were either left to decay or were torn down. Fisher’s wood-house and hog cote were both gone by the time a local foundation took over the property in the 1950s. The barn lasted into the 1990s, but eventually it too succumbed to decay and was dismantled. The Jonathan Fisher Memorial constructed a further addition to the house in the 1970s, in order to house exhibition space and offices. The New House today, looking much as it would have looked in 1818. In spite of these changes, Fisher’s main house of 1814-18 is remarkably intact. When the Fisher grandchildren who had been living there left Blue Hill, a number of local citizens concerned for the future of the building made arrangements that eventually led to the transfer of ownership of the house to a local non-profit foundation, the Jonathan Fisher Memorial, and made it possible for the house to be opened to the public.